They have a monopoly on research and development of weapons and high technology of the Imperium. As fragmented as the Adeptus Mechanicus may be within the organization, this privilege along with the ardent belief in the Machine God is what unites them. An army of cyborg warriors, priests and god machines driven by such inspiriation is a truly fearsome opponent for any of their enemies. 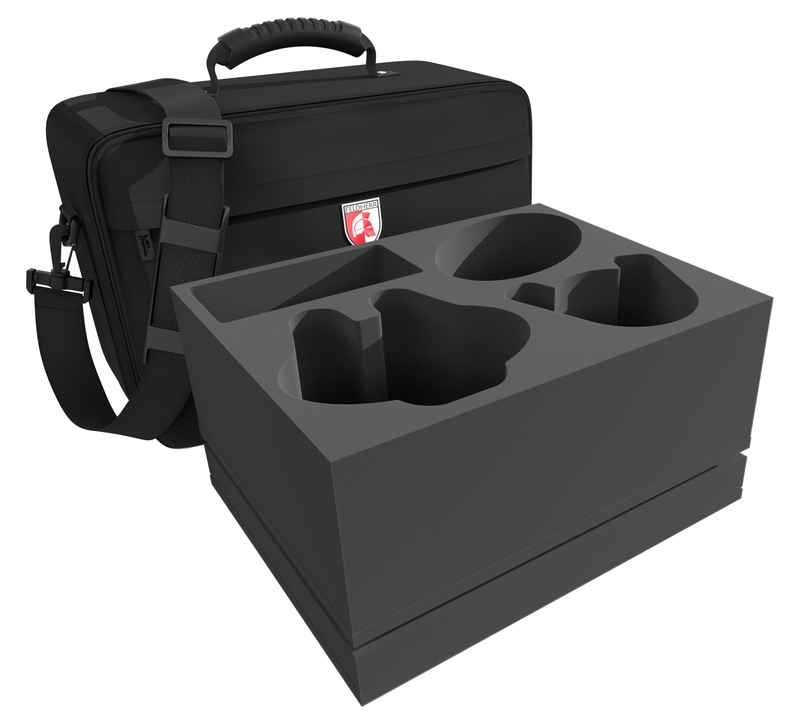 With our MAXI bag including foam trays, you'll get your army to the next battlefield unharmed. The Knight Castellan is a mobile towering fortress of the Dominus class. It is the foremost artillery platform within the lances of the knightly houses. To keep Shieldbreaker Missiles, Siegebreaker Cannons, Volcano Lance and Plasma Decimator operational, the matching foam tray ensures the correct storage of this war machine aside the battlefields. The tray is divided into 4 individually tailored compartments. The gigantic Knight Castellan can be stored safely in two parts - upper part with weaponry and lower part with legs. Surrounded by foam, the sensitive parts of the miniature are well protected, even during transport. 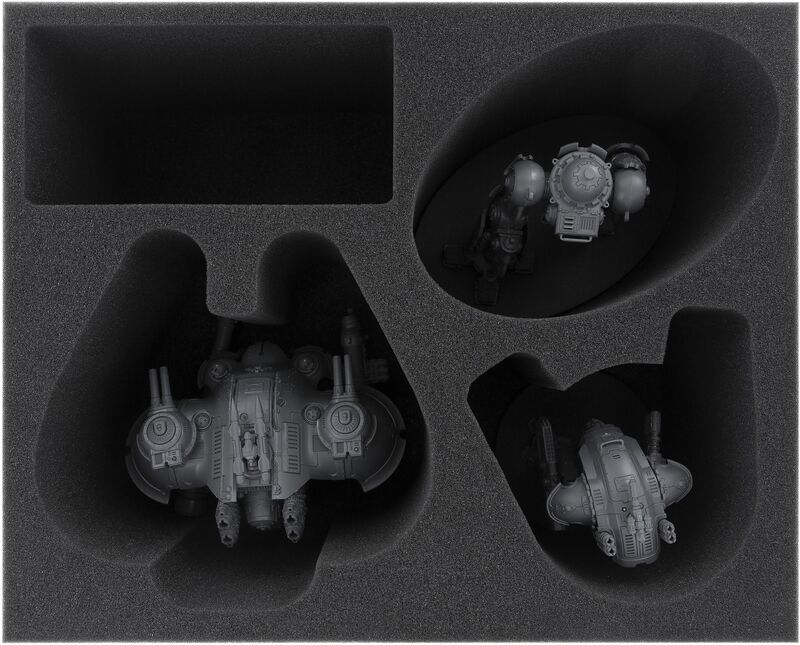 To complete your long-range unit, the mat has 2 additional compartments tailored for 2 Imperial Knights. Storing the figures in individual tailor-made compartments not only protects the sensitive parts of these detailed Games Workshop models, it also keeps them from slipping around and colliding with each other. This prevents the colors of painstakingly painted miniatures from flaking off. Because fighting machines alone do not constitute a complete armed force, we have created space for the cold-blooded warrior units of the Adeptus Mechanicus with the second Full-Size foam tray. With 25 compartments it offers room for the relentless hunters, the Skitarii Rangers, as well as for the fearless "Rad Troopers", the Skitarii Vanguards. And because a good Mechanicus army must not lack religious obsession, the Fulgurite or Corpuscarii Electro-Priests can also be accommodated on this foam mat. Therefore Radium Carbines and Galvanic Rifles of the Skitarii are just as well protected against damage as the Electrostatic Gauntlets and Electroleech Staves of the Luminen. A matching foam topper completes the all-round care of your Adeptus Mechanicus army. By this, your units are ready for the next battle in the name of the Machine God - anytime, anywhere. The comfortable MAXI bag is made of particularly hard-wearing fabric. Padded side panels and a reinforced base additionally ensure that your Mechanicus force is optimally protected from external influences even when transported by car or train. 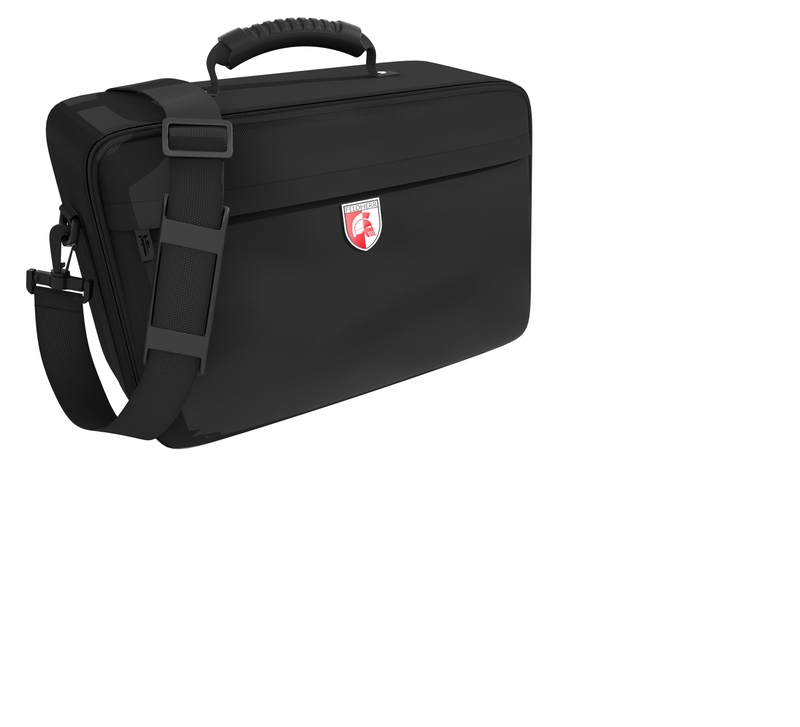 Next to the large main compartment, the bag has a smaller pocket with a zipper at the front. Here you might store Datacards and Codex. There is a rubberized, easy-grip carrying handle on the top. If you prefer to keep your hands free, you can also use the bag as a shoulder bag thanks to the solid, removable shoulder strap. 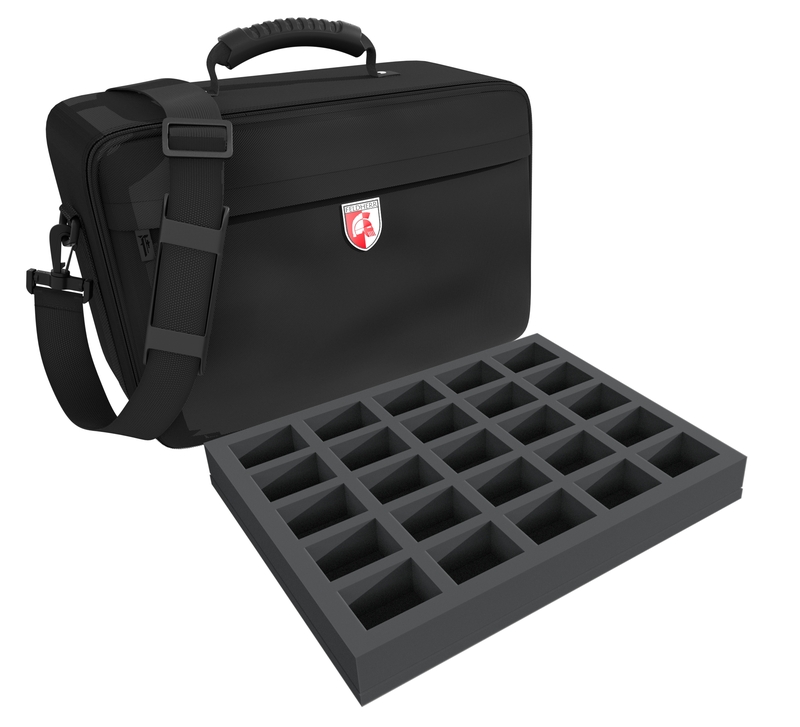 Each of the 25 compartments of the tray FSLQ040BO is 54 mm long x 41 mm wide x 30 mm deep.